George Morris that is. His status in the horse world is such that he can almost be referenced by only his first name…much like Beyoncé or Madonna. I was able to watch about 30 minutes of the George Morris Horsemaster Training Session Day 2 video on the USEF Network this morning. In that short time span, I was able to glean the 10 commandments according to George. They are true no matter what discipline to want to claim allegiance to – dressage, eventing, hunters, jumpers, western, or happy horse owner/rider. 1) Half halt, half halt. 2) The horse must travel and stop uphill. 3) Inside Leg to Outside Rein. 4) Invite the horse to self carriage. 5) Keep contact and ride it from behind. 6) The horse must listen to the hand. 7) The rider must give a little. 8) The horse must stretch over the back. 9) Half Halt. Yes, it is that important. 10) Regulation of stride and straightness of the horse is the responsibility of the hands. So there you have it. When I read this list, I see Charlotte riding Valegro in their stunning musical freestyle. They make it look effortless even though we all know it is not. They are the embodiment of these concepts and what we should all strive to achieve. This could also be my list of goals for the new year. If I can master these skills, everything else will fall into place: qualifying for the Region 1 BLM Championships at First Level, qualifying for the USDF Region 1 Championships at First Level, and earning my First Level scores needed towards my USDF Bronze Medal. So I’ve got 364 more days this year. Time to get started! So What About Day Two of the Show? Well, sigh. We ended up scratching our rides. Disappointing for sure, but definitely the right thing to do. Well, crap. Came back for the second day with high hopes of bettering my Saturday scores, but it was not to be. Better to stop than to make a small problem worse because of my greediness for a few extra percentage points. Ike went home, ate some oats sprinkled with bute and was turned out with his buddies for the afternoon. I headed back to the show to see if any extra volunteer bodies were needed. I first caught up with some of my dressage buddies that I honestly don’t get to spend enough time with on a regular basis. 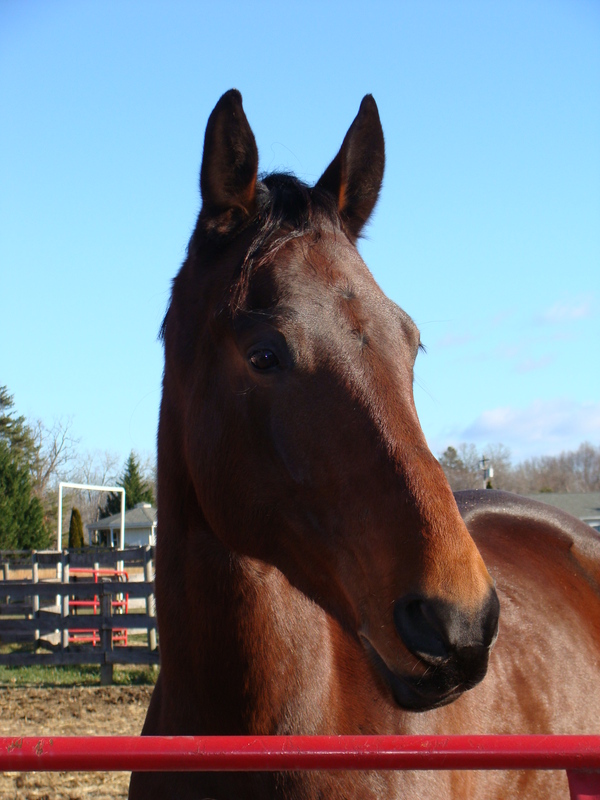 We all lead hectic lives complicated by our equine friends, not that we complain, but it does seem to limit social time. I also watched some fun musical freestyles and did some shopping. 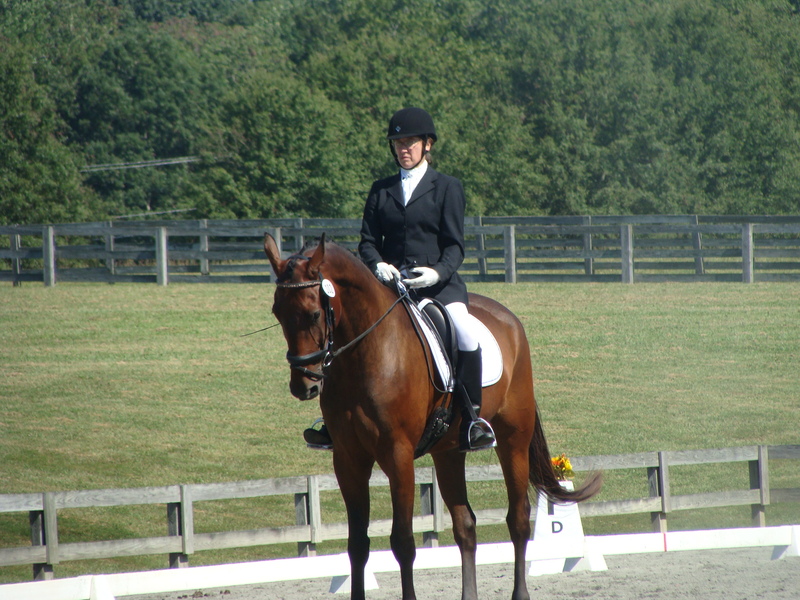 [Time for some boasting…] My dressage chapter might not be the biggest one around, but we do put on a hell of a good licensed show. We run the weekend as two one-day shows so people can get their two scores from two different shows and two different judges in one weekend if their rides go well. We have cool prizes, a used tack sale, equine rescue booths, and have awesome vendors who bring must-have items for competitors and volunteers. I voluntarily opened my wallet multiple times. I then helped out at the awards table and bided my time until the worst job of the show was needed: the show ground clean up crew. Everyone is tired. Everyone wants to go home, but someone has to break down the rings and load them on the trailers, take down the tents, pack up the ribbons and extra prizes, and show supplies and decorations. Those 10-gallon buckets filled with stone that hold the signs aren’t going to march themselves back to storage. Someone has to clean up the cigarette butts that someone thoughtlessly tossed in the grass. Then all that stuff has to be hauled to storage and squirreled away until next year. Why is it we forget to pack the cold beer to swill when all this is said and done? It is exhausting, but each year we seem to learn a little something that makes the clean up just a wee bit easier. The day didn’t turnout how I planned, but it was enjoyable nonetheless. Great friends, gorgeous horses, and a sunny fall day. Can’t ask for much more than that. p.s. The vet comes Thursday to check out the big man. He didn’t appear to be in any discomfort today. I will pop on him tomorrow to gage where we are. Keeping my fingers crossed that it is just something minor. The newest obsession in my life? Trying to put together a musical freestyle for competition this summer. Ready or not world, here comes Baby Huey dancing down centerline. Ike of course is too busy swatting away the early spring flies and renovating the barn to care about this new obsession. So all the details of the production fall on my shoulders. I listen to our music while I work; I listen to it in the car; I hum it when I don’t have any other option. Over and over and over again. I now understand why it is so important for the rider to like the music as well as having it work with your horse’s gaits. Who wants to listen to crappy music repeatedly? I try to imagine which parts of the musical pieces will work best for the choreography I’ve drafted. We aren’t talking a high degree of difficulty since all we have to work with are Training Level movements – no lateral motion, no canter pirouettes, no flying changes to jazz things up. 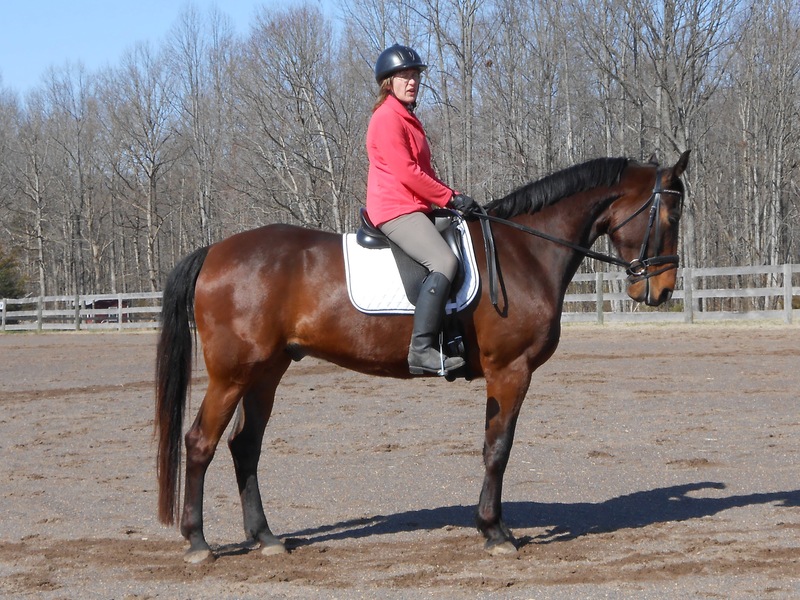 Just basic walk, trot and canter. With the time constraints placed on the freestyle, plus the compulsory movements required, that doesn’t leave a lot of spare time for extra flair. We will have to get into the ring, dance and prance, and halt before the clock strikes 5 minutes gone and we turn into a pumpkin and a mouse wearing riding boots. Ms. C has been pressed into service in this endeavor. I hijacked our weekly lesson to brainstorm freestyle ideas. I brought the small CD player from home and set it up on the mounting block. Even with the volume at the highest setting, it was almost impossible to hear the music if I moved more than 15 meters away from the speakers. That is going to be a bit of an issue. Hard to tell if things are working if you cannot hear the music. Issue number two – even though I know the CD player works just fine indoors and that the CD has no problems when played on the laptop or in the car, when I blasted it outside, it skipped, skipped, and skipped some more. I would just get our rhythm in time with the music, and it would skip, and then we’d be a half a beat off. Half halt quickly! “You are still off the beat – listen for the clap.” Grr. Just can’t escape those half halts even while trying to have some fun with music. Overall, I think Ms. C liked my initial attempt at choreography. She gave me some great tips to improve it and to also give Ike and I some wiggle room especially with our transitions. No point setting ourselves up for failure from the start. By the way, hats off to those who are responsible for writing the regular tests for each of the levels. I now have a greater appreciation for how difficult it must be when the tests are rewritten every four years. While all this freestyle planning is fun and interesting, we can’t lose site of the fact that two weeks from Sunday is our first show of the season followed quickly by our second one the following weekend. If we can’t get the scores we need from the regular tests, all this musical freestyle planning will go no where but home…and the audience there (the hawks, horses, and the barn cat, Annie) aren’t always appreciative of all our hard work. Guess we will refocus and knuckle down this weekend. Greetings! Sorry it has been a few days since I’ve updated the blog. Ike and I have been busy enjoying the spring weather that has finally appeared in the Mid Atlantic region. While enjoying the weather, I’ve also been contemplating our musical freestyle routine. It seems simple enough on the surface: pick some cohesive musical pieces and then choreograph a routine with the music. For the more musically inclined, I’m sure that it is simple. For people like me who can’t tell an A from a C when listening to someone sing and who believes that sheets of music look like hieroglyphics, editing music pieces into a cohesive musical performance is almost an impossibility. At least we have three pieces of music that I know work for Ike and I thanks to the Riding to Music Clinic with Michael Matson. We have them on an audio CD that is either in the CD drive of my computer or in my CD player so I can listen to the pieces over and over and over as I try to determine which parts of the pieces could work for a freestyle. Too bad that I just can’t head down centerline with the pieces as they are right now. Mr. Matson recommended some free music editing software called Audacity, so I have downloaded it onto my laptop. I managed to do it without too much hassle. I then copied the three music pieces onto my laptop so I had working copies to edit. Yes, I was able to do that as well. And then things got sticky. It turns out that the pieces were in a format that Audacity could not play or edit; the software which is smarter than I am about music formats suggested that I convert the files to .wav files so that I could edit them. Back to the internet I went to find some software that could help me. I downloaded that software (and a bunch of “crap” since nothing is truly free), and after a couple of false starts, I now have my three pieces of music in a format that can be edited…supposedly. I stared at the Audacity screen for quite a while the other night. The best I could manage was to play the music and then stop it. Yeah, yeah, guess I will have to try to decipher the manual. I don’t have high hopes. Luckily I have a couple of friends and some friends of friends who are musically inclined. I’m hoping that they can show me some basic music editing skills that will get me started in the right direction or at least past the start and stop buttons. While I struggle at home to edit, I also need to overcome the obstacle of how to listen to the music while I ride. Currently, I do not own an iPod. Yes, really. I do not. Do I really want to invest in one just for this purpose? While it could be helpful, it won’t help me if I enlist Ms. C’s help in the choreography for the routine. How will she hear the music? I have a Bose system, but do I really want it exposed to the dust and dirt at the barn? Nope. My only option right now is a small radio/CD player in our guest room. Fingers crossed that the volume can go loud enough that I can hear it at the far end of the arena. I think Ike is tiring of listening to my off-key humming of the parts of the music that I can remember. Sadly, the only part of the trot music that sticks with me is the tune “I’m dreaming of a white Christmas,” so poor Ike has been subjected to it repeatedly for the past week. I’m most certain that he is decidedly not dreaming of any white form of precipitation. Looks like the weather will cooperate until the end of the week, so we will give my little sound system a go in the next day or two. Wish us luck! P.S. Thought I would fill you in on Ike’s barn renovation work. Sigh, I guess it was not enough that Ike decided to nibble on the critical infrastructure of the barn. He has now broken off the chain of the ceiling fan hung above his stall. Well, Ike, I hope you like the speed of the fan since we will no longer be able to adjust the fan speed. I fear that we will have to raise the fan higher or risk Ike eating the fan blades. In case you were wondering how Ike and I did at the ride to music clinic today, I can inform you that I could not be prouder of my big boy. We came home with three awesome musical selections. But before I fill you in on the clinic details, I must share that we almost didn’t make it to the clinic. That is right, someone showed off his mule genes for almost 45 minutes. I had to dig deep into the recesses of my memory to remember all the lessons that Mr. Revelle taught us last year: do not back away or walk away from the trailer, use the stud chain appropriately, reward any effort, say “load up” as you lightly tap the hind end with the whip (note to self – purchase a longer piaffe whip or have arms stretched to reach the go button on the back-end), remind Ike that the only correct answer is to get on the trailer….I seriously thought that we weren’t going to make it on time if at all. Finally, Ike sighed and calmly walked on. Huh? Why all the fuss??? He would not share his rationale. First up, the trot. Amazingly enough, the first piece worked and worked well. Was that really that easy? Yes, yes it was. Turns out, Ike likes swing music. We tried a few other pieces, but the first one was spot on. The walk was next and finally the canter. I have to say, I love our canter music. All three pieces are swing – I guess it is in keeping with his namesake, Dwight D. Eisenhower, who was a five-star general during the 1940s when swing music became prominent. Am I Strong Enough To Do This?? Some days I ask myself that question over and over and over and over again. Ike can be light as a feather for a few strides, and then moments later, I feel like I’m running around the arena with a 50-pound bag of feed in my arms. I struggle to maintain my position in the saddle. I squeeze my fingers until they ache. My arm muscles cramp. My abdominal muscles jiggle from the effort. We down transition and halt. Ike then tries to yank the reins from my tired fingers. I don’t let go. He sighs, I sigh, I ask him to soften in my hands and we try it all over again. Am I alone in this struggle or does anyone else feel this way? 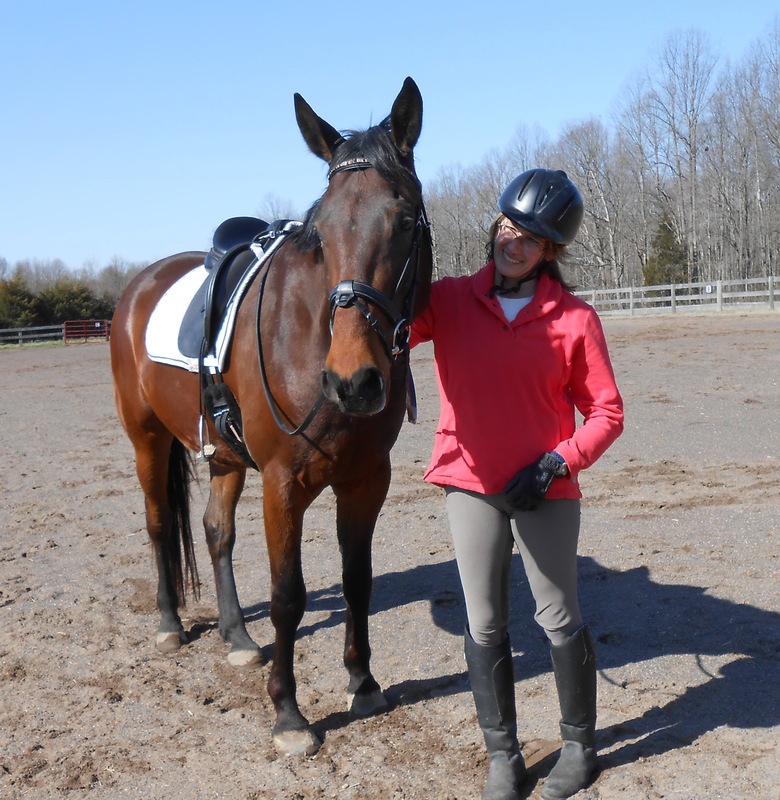 For the first half of my lesson no matter what gait we were riding, it felt like I was riding two different horses with me in the middle trying to make them work as a team. Ike’s front end was rolling along at one rhythm and his hind end was dancing to a different tune. That should make the clinic tomorrow a bit interesting. We are attending our first musical freestyle clinic. My local dressage chapter is hosting Michael Matson. 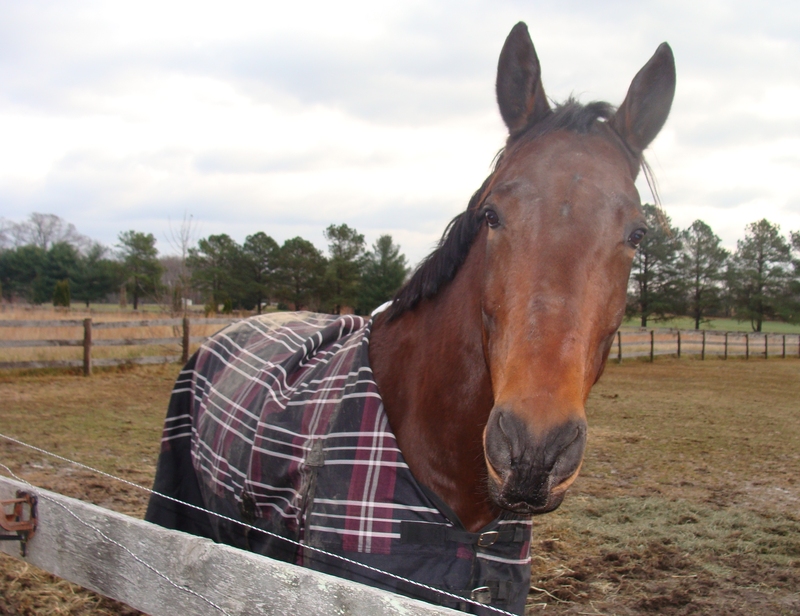 He is a well-known clinician in this area known for helping riders with musical freestyles. 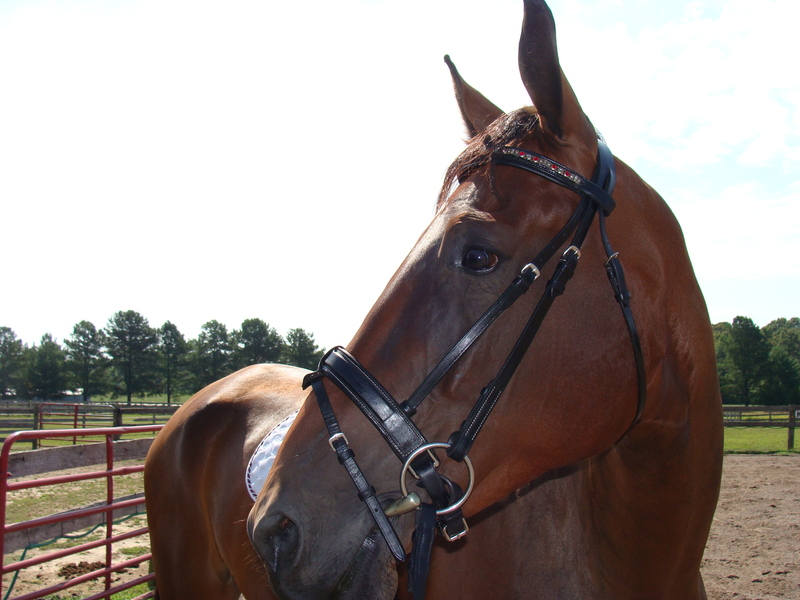 He helps you determine your beats per minute at each of the gaits and then helps select music to enhance them. Sounds easy enough, but when you have two different rhythms, how do you pick which one to use for the musical selection?? I jest here. I am well aware that you can’t. It should make for an interesting ride. We could very well be the first rider and horse pair to come away from the clinic with no music. “I’m sorry, but you would be better off riding to a baby banging on some pots and pans.” Bet that would elicit some interesting comments from the judges. Will let you know how tomorrow turns out…would anyone like to take a guess at what music Mr. Matson will select?